Tender sweet peas are showing up at the market and what could be better than a springtime pasta. English peas and mint are always a natural pair, and I always love combining the two. If you are a fan of spaghetti carbonara, consider this its kin, with bacon instead of guanciale, parmesan instead of pecorino, and no eggs. I would say it’s a lighter version of carbonara, but I can’t. It has heavy cream. And you wouldn’t want to leave it out. For once, enjoy the cream, it’s worth it. This recipe is from Saveur Magazine. The mint will make you smile. The peas will give you spring fever and the bacon…well, you know. And besides, it smells fantastic! Bring a pot of salted water to a boil. Add pasta and cook until al dente. Drain pasta, reserving 1 cup of the pasta liquid. Meanwhile, if you are using bacon, cook over medium heat until crisp, remove from the skillet and set aside. If you are using fresh peas; discard the bacon fat and return the same skillet to medium high heat and roll your peas around until tender, about 5 minutes. This step is unnecessary if you are using prosciutto and thawed frozen peas. Next, boil the cream in a large skillet over medium high heat, stirring frequently, until reduced by half, about 8 minutes. Add the pasta and peas. tossing occasionally until the sauce begins to cling to the pasta, about 5 minutes. Add the parmesan, and season with salt and pepper. Add reserved pasta water as needed to loosen the sauce. Fold in the bacon and mint. Chefie can be a bit of a food purist, so he was appalled when I first suggested we add peas to our carbonara (I had to try and add some nutritional value to the bacon/cheese/egg explosion somehow). But he acquiesced and now he loves the peas. And Chefie never met a dish with heavy cream that he didn’t like, so we’ll put this beauty on our to-make list. Hahaha. Glad you are able to persuade! You just have to make this then. It is, in my humble opinion, the best combination for a pasta sauce. Especially the fresh mint. Love meals like this, so simple and elegant. Perfect for spring. Very authentic and delish spring pasta. Looks so appetizing. Thank you. I alway wonder about authenticity when I make pasta. I wouldn’t think mint would fit the bill but, it certainly tasted delicious. It’s the perfect combination. I have been searching high and low around here since last week for fresh mint. I made souvlaki, and needed it for the tzatziki sauce, and had to use dried instead. As soon as it’s in the store again, I’ll be making this meal. Yes, you’re right. I made this on a Thursday night when I’m a little more spent from working all week and coming home and getting dinner on the table. Three of us almost ate the whole platter full. Delicious! I love peas, mint & pasta but, will have to find a substitution for the meat. Yes. Two finicky eaters in the same household makes it a bit of a challenge for me but, I’ve gotten very good at improvising. Although, I have to admit I never thought that I’d get tired of chicken but, there have been times I question it. Ha! What a refreshing recipe. I always love simple and delicious recipes like this :). I normally read all kind of recipes. There is a thing or two to learn from everything :). BTW, I am the only vegetarian in my household :). :) Oh wow. That is very independent. You have a mind of your own don’t you! Peas and mint, such a winning classic flavour combo! Yum! I’m pretty sure my kids would eat this everyday. Perhaps I should make this tonight for a treat? Certainly is a treat B! My son would eat it every which way Sam I Am would eat green eggs and ham! He practically finished off the whole platter full. Hope you cook it for them! I love the idea of your chalkboard menu. I think I could use something like that in my kitchen. I try to shop for 3 or 4 days at a time and then when it comes time to cook I never remember what I was going to make! It’s maddening. Writing it down on a lovely chalkboard would be the way to go. And give the family something to look forward to. 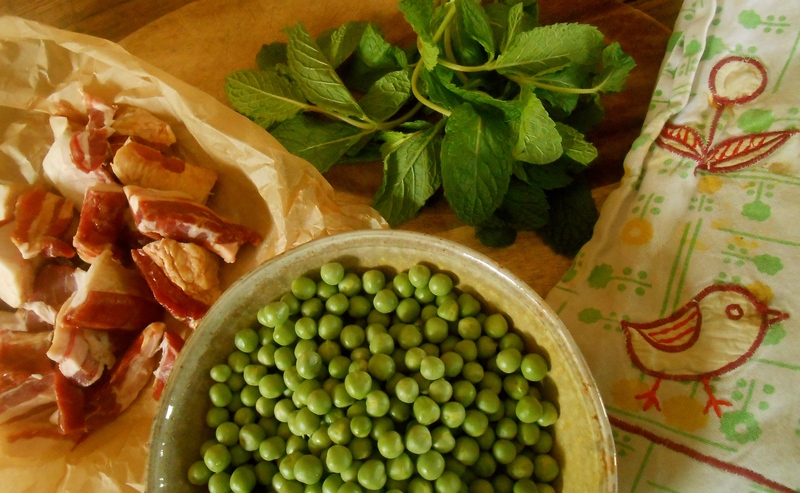 Something about the mint, peas and bacon in this recipe Lindy…it was so fulfilling and agreeable. :) you changed your gravatar back to the peace sign! The chalkboard menu is fun and when I see things i love – I just go and write the titles on the chalkboard. It’s a great reminder and keeps me on task in the kitchen. When I head out to the grocery store – I check over the chalkboard and know what I’m doing. The peace sign – I know – I keep trying to change! thank you…it really was delicious. Hi Saucy! :) you set the scene perfectly. Especially the plural “plates” of this pasta…I did have plates of this one. I’ve yet to leap into white wine this season though. I’m funny when it comes to wine. Red in the colder months, white and rose’ in warmer weather. Today was a warm one though! Actually rode my bike in short sleeves. I’ll make this again and crisp white wine will be on the side. I knew you’d like this one. It’s perfect. Really. So springy. I really want to make this. The mint is such a fresh and wonderful touch. Yum. First time using fresh mint in pasta and wow! it’s amazing. Especially peas, bacon and mint…and parmesan! Make it Amanda. You’ll be pleased. Hi and thank you for your comment. :) My mint is finally starting to peek up out of the ground. Such a wonderful herb to have growing abundantly. Peas and mint is classic, love this recipe. It’s so Spring, can’t wait for peas to show up at the market here. Aren’t fresh peas so much better than frozen. I would rather not eat them if I have to use them frozen. Almost as though it is a completely different vegetable. It’s a little work to remove them from the pod, but so worth it. I love removing peas from the pods, the only problem is that I love eating them raw and sometimes don’t have enough left to make anything. They are so sweet and fresh, they taste like spring. I would like a picture book of all the recipes you publish on this blog. Pretty please ;-) Your photos are always lovely. This dish looks springy indeed! You are too kind Liz…honestly, sometimes I feel so boring when I see other blogs and all the cool props, angles, lighting and whatnot. Mine are so straightforward, not fancy and well…very minimal. Sort of like my house…Thank you! I think that’s why I enjoy your photos so much–they are not showy and aren’t about bragging up your equipment and clever shot angles, props etc. It’s just about the food and how lovely it is. :) Thank you…means a lot to me. Lucky! Growing your own peas! Lovely. I wish i had made it up!! A great combination of flavors and perfect to celebrate spring. Thank you Karen. Nice of you to visit and comment today. Wow, fabulous. I’m trying that next weekend! Hope you do Luffy! It’s such an incredible combination of goodness. Very luscious pasta sauce. I’ve always loved the flavour combination of peas and mint and must confess can never pass on a beautiful carbonara. This looks divine. Truly divine this combination isn’t it. Love peas and mint too, and now with the addition of bacon and parmesan…even better. What a delicious looking spring salad! I’ve yet to see fresh peas yet in the markets and can’t wait for them to get here. Pasta dishes like yours here are the reason why. Peas, pork, and pasta go so well together. So true, peas bring such excitement because it is a sure sign the season is changing. First time using mint in pasta… I don’t think it’s authentic? but it sure was lovely. Peas & mint, I love the combination. There is hardly anything that would make a better dish … but bacon. Great change after my eggstravaganza (another egg dish after the chervil deviled ones coming soon). Oh good! love egg recipes! Looking forward to seeing what’s next. Love pasta– and your pasta recipes are always the best Seana! 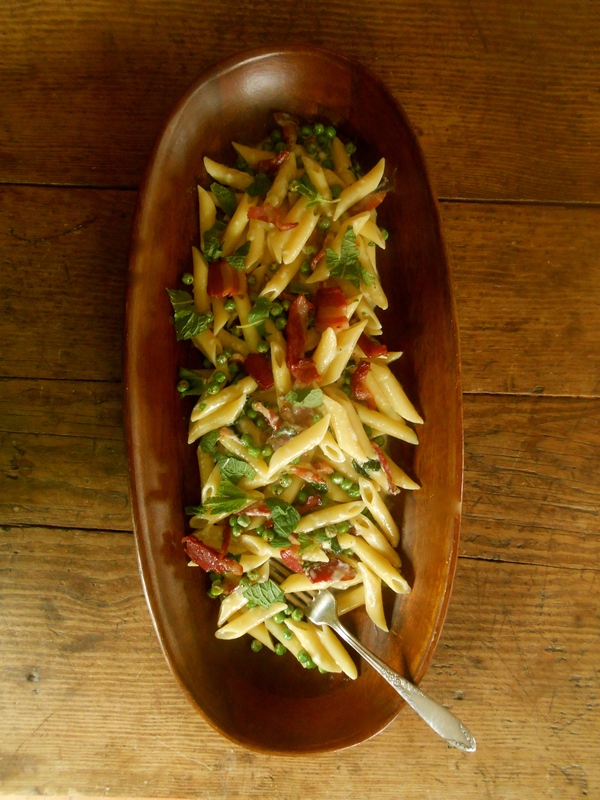 Love this pasta dish- perfect Spring meal! this looks so good. love peas for spring! :) Thank you for visiting and your kind comment. You are currently reading spring peas & mint at COTTAGE GROVE HOUSE.